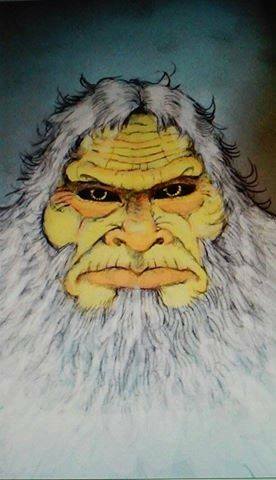 Drawing of the white bigfoot. A largely overlooked aspect of bigfoot encounters is the psychological effect it can have on a person. While many of us have the desire to see one of these incredible creatures, not everyone feels that way. Some individuals are terrified by the thought that these things even exist, let alone possessing the desire to see one in person. But what if the situation was different all together? What if the person had no idea what a bigfoot was? What if the person wasn't out looking for one, and had no idea what was happening to them? That was the case for Pamela Stewart Vasko. Pam was an expecting mother, taken from her life in the city, and placed into the secluded backwoods of Indiana by her boyfriend at the time. It was a bad relationship, he was hardly ever home, and most of the time Pamela was left to fend for herself in a house that didn't have running water or electricity. For most of us this seems hard to imagine, a situation so horrible, and for Pamela it was a reality. As if life wasn't hard enough for this woman, she started noticing strange occurrences happening. Strange screams and howls coming from the woods. Something banging on the side of the house. Large, human-like hand prints, 15 feet up on the side of the house. Something paralleling her as she would walk down the road to her mailbox, always staying out of sight. Still none of this would prepare Pamela for what would eventually happen. Pamela's bigfoot encounters are both amazing and incredible. A lot of people would even find them hard to believe. For Pamela, they would impact her in a terrible and crippling way. She had no one to turn to. No one believed her. Her encounters would lead to a life of terror, anxiety, and paranoia. Pamela even went as far as moving to a different state to escape just the slightest possibility of encountering one of these creatures again. Luckily, Pam has started to overcome her fear. She was able to find the support of some individuals who have also had encounters, and have helped her come to grips with the things she experienced. Below is a written account of one of Pamela's encounters in her own words. Mar- Apr 1988 Here is my encounter with a big 9-10 ft. white bigfoot in Southern Indiana in 1988. It was spring and my ex and I were on a horse ranch and the ex was helping the women and her son delivery baby draft horse . It was like 3:00 am when we were woke to go to the barn so the other three went to the barn and I was going back and forth from the house to the barn bringing coffee hot water for them to wash their hands because they were helping the mares . So it was dawn and one of the mares came running down the hill and she didn't have her baby with her . I walked over to the fence and was trying to see if I can calm her down but she was kicking and bucking,snorting and she sound like she was crying . I didn't know why her baby wasn't with her . I looked up to the top of the hill and there stood a massive white creature . I thought "It had hair like a bear but it looked human ". I was so confused by what I was seeing and so I ran in the barn and told three in there that there was a creature at the top of the hill and the mare doesn't have her baby. I begged them to come outside and look and they were helping a mare so they couldn't come out yet ( they said after they were done helping the mare they would go look for the baby ) . In the mean time I ran back outside and looked up the hill and he was still there but was moving toward the woods . The three in the barn finally came outside and the bigfoot stepped into the woods . Well they started dogging on me a putting me down and not to waste their time . The two guys in the barn decided to go up the hill in a truck and find the missing baby draft horse .Then he stepped out again and kept watching me watch him . He walked back in the woods . I kept watching up the hill but I couldn't see him . I had two little girls in the house asleep and I was freaking out by what I knew I had seen .The two guys came back and said the baby draft horse was dead on the back fence line and they would go back up and bury after they were done dealing with the second mare who was also having a baby .They did bring the mare inside the barn and you could hear her crying, and she was just plain freaked out . They thought it had died of natural causes . ( The whole time since I had spotted him I had tears running down my face because I was scared and they weren't believing me . I was in hysterics and I didn't know what to do but keep my eyes on him , I also was shaking with fear the whole time this is going ). I kept looking around the right front side of the barn and he would be looking around at me . Then he turned and went back in the woods and he was gone .After 45 minutes all of a sudden he busted out of the woods and was carrying the baby draft horse and he laid him down on the ground up behind the barn in the tall grass ,While he was gone in the 45 minutes and I kept running from side to side to see if I could see him again . I still kept thinking "He had hair like a bear and he looked like a human". I was praying because I didn't know what else to do . I kept saying " Oh my God in my head." After he had laid the horse down I ran back in the barn and told them the white creature ( At this point I still hadn't said bigfoot because I was taught they didn't exist , but I knew that was what I was seeing . ) had brought the baby draft horse but they didn't want to hear it . They were all laughing at me and so I just went back outside and I looked for him but I couldn't see him until I went over to the right front side of the barn and he was climbing down the hill towards me and the back side of the barn .I ducked behind the front of the barn and then I'd peak out again and so would he . I looked out again and he was closer and I would look again and he was at the back of the barn touching it and I was shocked by how massive he truly was . He was half way up the side of the barn in size and his chest was 4-5 feet wide . I was 5'ft.6 1/2 inches tall . I have never seen a human the size of him . I would look around a little longer each time and so would he . I didn't know at the time he started not being there when I would look and I would run to the other front right of the barn and look , he wasn't there . Then he would look out again . I looked him in the eyes and his eyes were dark brown with a little yellow around the pupils . His face looked human and his hands and feet looked human . He was a gray white with streaks of colors here and there on his body . I don't know if he was dirty or it was just his hair changing colors . His face looked like an old mans face , I was so surprised that he was so human like and I notice his right canine tooth was broke and looked close to the size of his other teeth . He would be gone away from the side of the barn and I would run down to the other side and look around . Then he would be back to the right back side of the barn again . A couple weeks a go I found out that the three in the barn had put the afterbirth in a wheel barrel and pushed out of the back of the barn . The two guys came out of the barn to go back up the hill to bury the baby draft horse . The white bigfoot hid because they said they didn't see him when they went up the hill . The only thing between him and I was the barn and a fence that was butted up to the barn . If he would have wanted to hurt me he could have because I couldn't have got away I don't think. After the guys left he came back and looked at me again and I still have tears running down my face and I looked at him for as long as he stood and looked at me . I kind of moved my lips into a partial smile( without showing my teeth ), and I could of swore on my life he did it too and then he turned and walked away and when he got to the top of the hill he bent down in the grass and picked up the baby draft horse and had it under his right arm with his left hand in between the two front legs . He turned around and looked back at me and walked off in the woods . I heard the crashing through the trees for a long time and I never seen him again. It was only then that I broke down bad I realized I could never talk about it because I was being put down by them . The guys came down the hill and were freaking out because the baby was gone and that they never found blood or hair on the barbed wire fence , they couldn't figure out what happened. I wouldn't talk to them because the way I was treated. I had been treated so badly by them. Up to a year ago my daughter called me laughing saying "Did your Mom tell you about The big white bigfoot she seen ?" I wasn't the only one who seen it the neighbors down the hollow had seen it too and the game warden and a posse of farmers went hunting for it . I wouldn't go outside and I sat in the windows watching to see if he came back . They found the baby draft horse and it stomach area was gone and the rest of the inter organs were all gone and I was told the rest of it was 3-5 miles away in the woods but they never found the bigfoot . I know for a fact that it wasn't a hoax because humans aren't that big and muscular or I have never seen a human take the long stride and carrying the baby draft horse 3-5 miles just to take the guts or a person who was 9-10 ft. tall . There is no way ! I personally didn't have anyone to talk about this and it is helping and I really appreciate everyone for these last few months because it is helping . I don't have any personal friends or family to talk to about it . I had read a few things about white bigfoots are albino but I don't think that was the case on this one . I think he was old! I hope this makes sense because I'm not good at typing and I was catching my self writing it as if I was there at that moment and so I had to go back and I tried not to write as I would say it Thank you everyone I hope you all enjoy it .